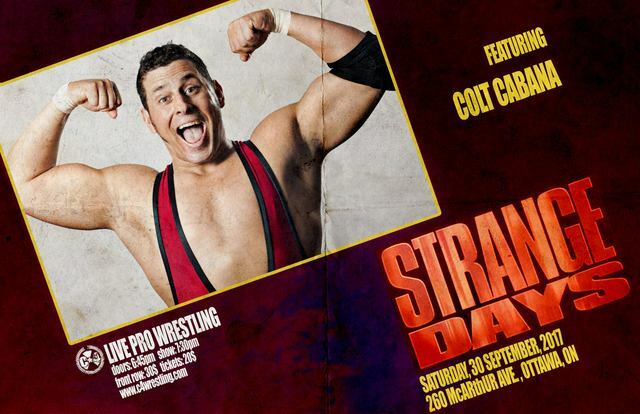 C*4 presents "STRANGE DAYS" - Season 11 Premiere - Colt Cabana Returns! Capital City Championship Combat Fan Community > C*4 Fan Community > C*4 Discussion (Moderators: Matt Fortune, RotchyKongISW, C*4) > C*4 presents "STRANGE DAYS" - Season 11 Premiere - Colt Cabana Returns! Re: C*4 presents "STRANGE DAYS" - Season 11 Premiere - Colt Cabana Returns! 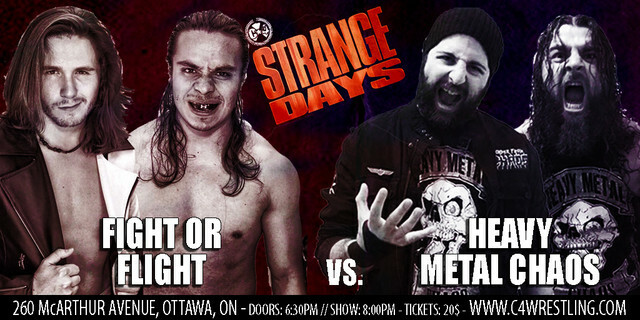 #C4StrangeDays – Main Event will see Champion vs Champion! Tag Team Grudge Match! Chaos reigned as C*4’s 10th Season came to a close in June. Following the extremely competitive battle for the C*4 Championship between Mathieu St. Jacques, Stu Grayson, and Thomas Dubois, all three were attacked by a group of talent, all seemingly unrelated, and led by Twiggy. The message wasn’t clear at the time, and we are still waiting to hear what brought Twiggy, Evil UNO, “The Beast King” FTM, and Tyson Dux together… And why they chose to attack when and who they did. Hopefully we will get some answers to these questions on September 30th… Almost two months later, no demands by any of the members have been made. No comments given. With that in mind, the show must go on – and on September 30th, we are planning to do just that. 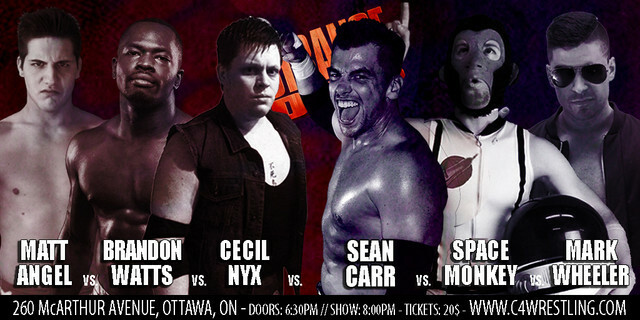 On September 30th, Mathieu St. Jacques will head into action as the longest reigning C*4 Champion of all time. A man who has dominated competition, and for two years, defeated the very best that C*4 has had to offer. At #C4StrangeDays, MSJ will face another man who has surprisingly managed to defeat countless opponents thrown in front of him, and retaining a Championship as he does it. On September 30th, history will be made as for the first time ever, the C*4 Champion will face the C*4 Underground Champion. 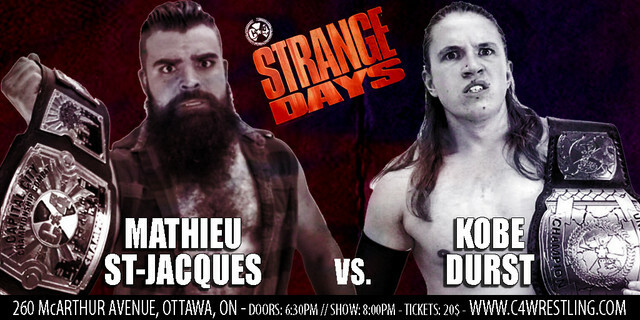 On September 30th, while Mathieu St. Jacques celebrates making history, another hungry talent will aim to make history, and become the only dual Champion in C*4 history… At #C4StrangeDays it will be Mathieu St. Jacques squaring off with “Diamond Tiger” Kobe Durst! As the ancient proverb goes: “The enemy of my enemy is my friend”, and with that in mind former C*4 Tag Team Champions, turned rivals, will once again join forces. Stu Grayson and Thomas Dubois want revenge for the men who assaulted them in June… and they will get that opportunity. #C4StrangeDays – First Time Ever! Colt Cabana gets “Dirty”! In March of 2011, we welcomed the then-NWA World Champion, Colt Cabana to C*4 for the first (and only!) time. A packed house welcomed the internationally renowned superstar, and many have requested his return ever since. We are pleased to FINALLY welcome back professional wrestler, podcastor, and all around entertainer, “Boom Boom” Colt Cabana! On September 30th, Colt gets “Dirty”! #C4StrangeDays – “The Walking Weapon” takes aim at the “Bad Boy”! We are three weeks away from the beginning of another HUGE season of action… We have another potential show-stealer to announce right now! Last March, at #C4MeanStreets, two of the favourites in the Six-Way Elimination match for the C*4 Championship were former Champion, “Walking Weapon” Josh Alexander and “The Bad Boy” Joey Janela. However, it was the pair who would be responsible for one another’s eliminations. And, with those eliminations came unfinished business between these two top talents. On September 30th, both men are looking for an important win, as both men are looking to finish what was started late last season. This is a match you do not want to miss! 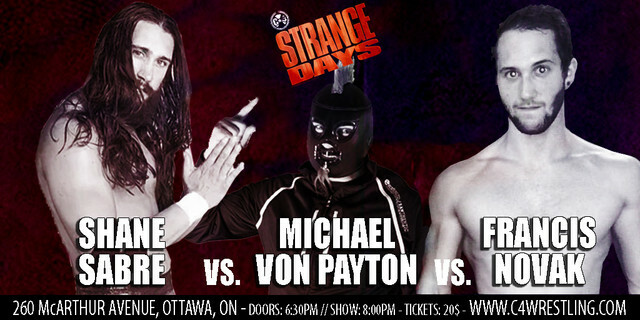 #C4StrangeDays – Tag Team Championships on the line! The “Concrete Rose” faces “All Ego”! Last May, Fight or Flight, Vaughn Vertigo and Gabriel Fuerza, shocked the C*4 audience, when they captured the C*4 Tag Team Championships, ending a one-month reign of Heavy Metal Chaos, James Stone and Alextreme. Following the match, HMC assaulted and official, and laid out the new Champions. As a result, HMC were suspended for two months. On September 30th, Stone and Alextreme will receive their rematch against the team that never pinned them, yet took their titles away. On September 30th, Fight or Flight get an opportunity to gain revenge against the team that destroyed their Championship celebration. This will be a war! One of the biggest stand-out talents to make their debut at last February’s #C4Underground3 was the American exotico, “The Concrete Rose” Sonny Kiss. Kiss went toe to toe with “Speedball” Mike Bailey, and despite losing the match, won the admiration of the entire audience. Finally, on September 30th, Kiss returns to C*4! His opponent is looking to make a statement this season, and dominate the competition this season… Looking to head to the top of the roster. 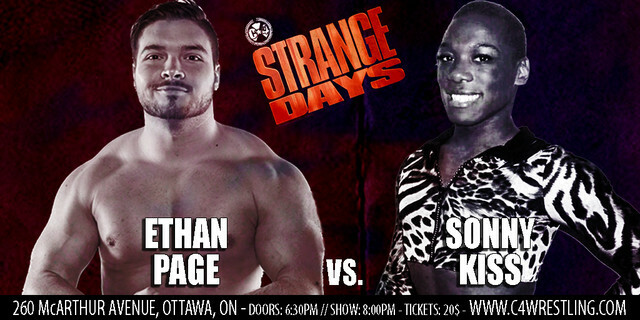 Back in action at #C4StrangeDays, “All Ego” Ethan Page! 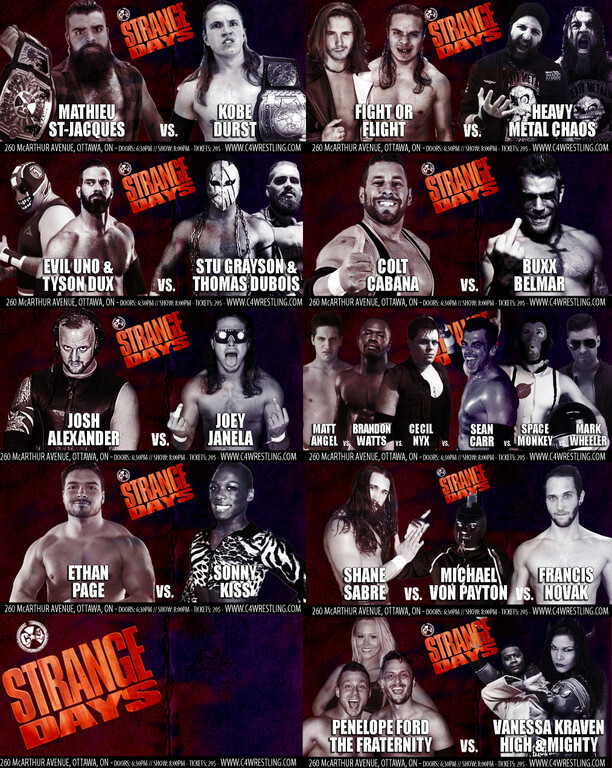 #C4StrangeDays – Intergender Trios Action! Next Saturday is rapidly approaching. We have another match to announce at this time! A match featuring two of the top tag teams in C*4, a young woman making her return following last Season’s Underground event, and one of the most popular talents on the C*4 roster. This will be something you won’t want to miss! #C4StrangeDays – THIS SATURDAY NIGHT! Full Card set! Debuts, and much more! We’re days away from the kick-off to our 11th season of action. We’ve already announced a loaded card, featuring some of the biggest and best talent from across North America. Right now we have two more matches to announce. First up a six-way scramble! Featuring some of C*4’s most recognizable and popular talents, along with a pair of up and coming contenders, and a pair of debuting indie standouts - this match is one that may steal the show! 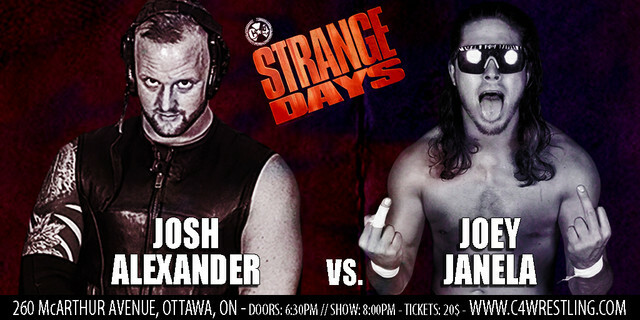 Rounding out the card, we have a three-way match signed for this Saturday night. This one will see the veteran, now-masked, “MVP” Michael Von Payton taking on the very hungry and talented Shane Sabre, as well a man who broke out in singles action last Sunday at “Do the Right Thing”, Francis Novak. There you have it! Nine huge matches are set for this kick-off to our 11th season of action, this Saturday night! You do not want to miss this one!